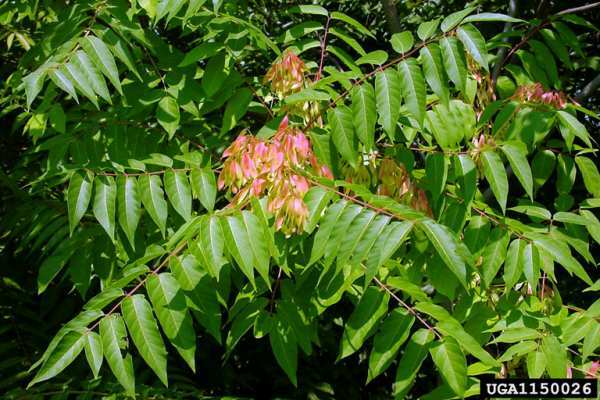 Ailanthus altissima is a very aggressive plant, a prolific seed producer (up to 350,000 seeds in a year), grows rapidly, and can overrun native vegetation. It also produces toxins that prevent the establishment of other plant species. The root system is aggressive enough to cause damage to sewers and foundations. 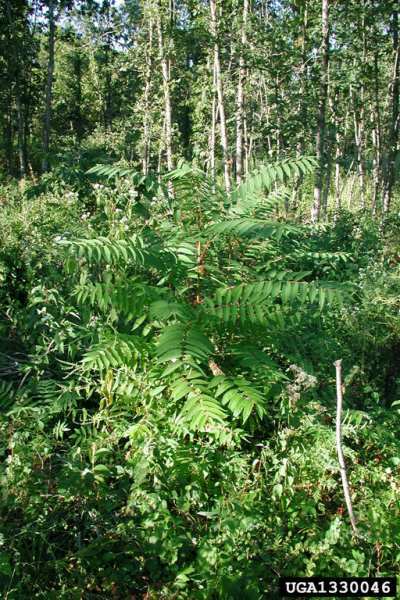 Ailanthus altissima is a small to medium-sized tree of the mostly tropical Quassia family. 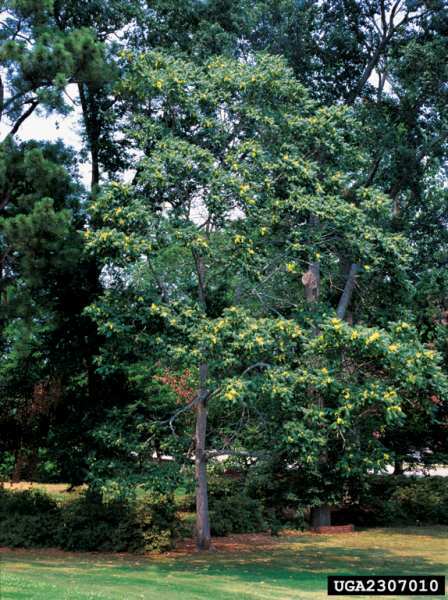 It has a smooth, grey bark with compound leaves which are alternate, odd-pinnate, with 11-25 lanceolate leaflets. Most leaflets have one to three coarse teeth near their base. Mature trees can reach 24 metres or more in height. Flowers occur in panicles at the ends of branches and the male flowers produce a strong odour, described as the smell of burnt peanut butter. The leaves, when crushed, also produce a distinctive odour. Seeds are centred in a papery sheath called a samara. The samaras are slightly twisted or curled and twirl as they fall to the ground. The wood of Ailanthus altissima is soft, weak, coarse-grained, and creamy white to light brown in colour. Male flowers are conspicuous and ill smelling, attracting many insects. Female flowers are less odorous and less conspicuous. Established trees produce numerous suckers from the roots and sprout vigorously from cut stumps and root fragments. Seedlings establish a taproot three months after germination. A. altissima probably lives for no more than 100 years in North America (usually less) but the root system and its sprouts can persist for a longer time. The wood is often used in China for lumber, fuelwood and other products. In the U.S. it is occasionally used for low-grade lumber, pulpwood and fuelwood. 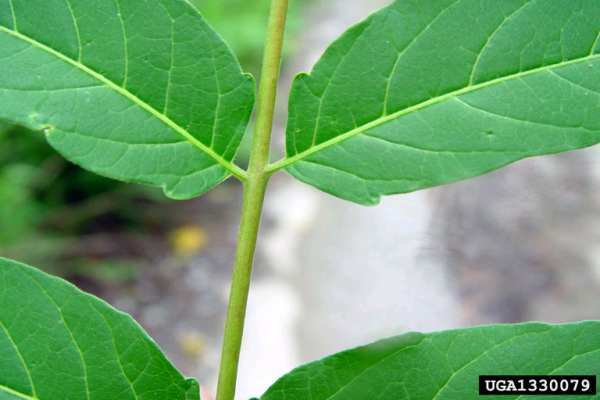 The toxin produced in the bark and leaves of A. altissima is being studied as a possible source for a natural herbicide. It is used in traditional herbal medicine in China. Ailanthus altissima establishes itself readily on disturbed sites, such as railroad embankments, highway medians, fencerows, and roadsides. In naturally forested areas, A. altissima may become established in areas disturbed by storms or infestations. A. altissima has the ability to grow in poor soils and under stressful environmental conditions. It grows in full sun and thrives in poor growing conditions. Germination rates are high, provided soil has adequate moisture. It is well adapted to heavy clays and other soils with low nutrient and oxygen content. Ailanthus altissima reproduces both sexually (seeds) and asexually (vegetative sprouts). Flowering occurs late in the spring (June in the middle Atlantic region of eastern United States). The species is dioecious (trees have either male or female flowers). A single tree can produce around 325,000 to 350,000 seeds a year. Trees grow quickly, as stump sprouts grow up to 3cm per day. 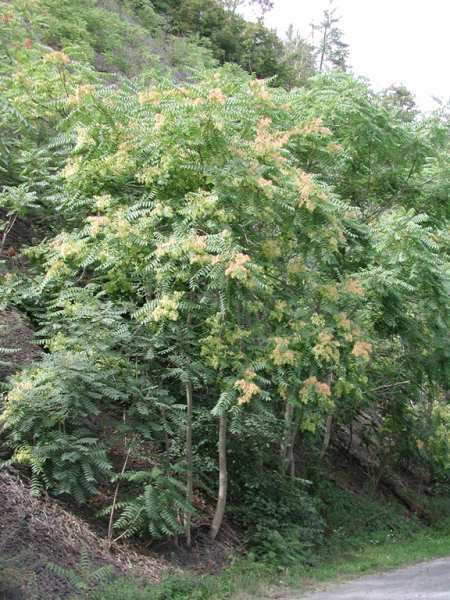 Ailanthus altissima is well adapted to heavy clays and other soils with few nutrients. Review: Phil Pannill, Maryland Dept. of Natural Resources - Forest Service. 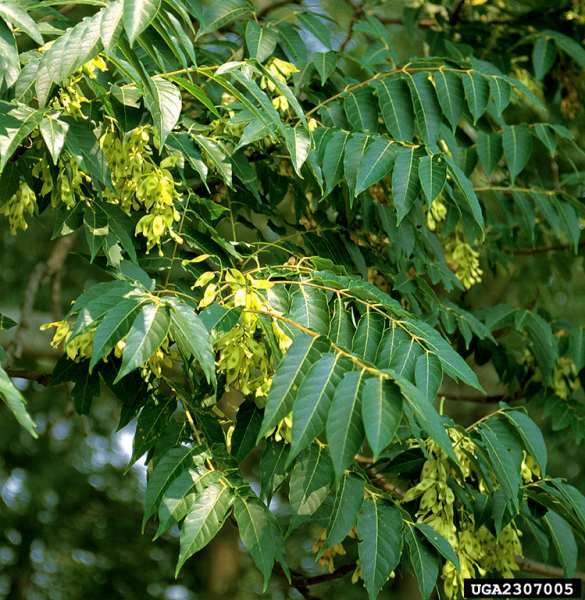 Recommended citation: Global Invasive Species Database (2019) Species profile: Ailanthus altissima. Downloaded from http://www.iucngisd.org/gisd/species.php?sc=319 on 21-04-2019. 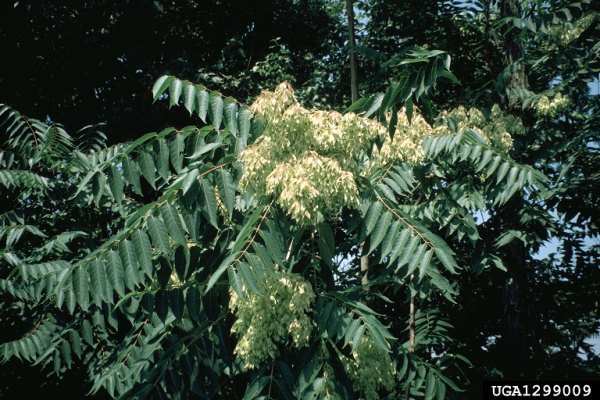 All over the United States, Ailanthus altissima has become a pest of agricultural, urban and forested areas. Seedlings and root suckers of A. altissima grow rapidly and spread prolifically and thus quickly out-compete many native species for sunlight and space. It also produces a toxin in its bark and leaves. As it accumulates in the soil, the toxin inhibits the growth of other plants. The root system is capable of damaging sewers and foundations. 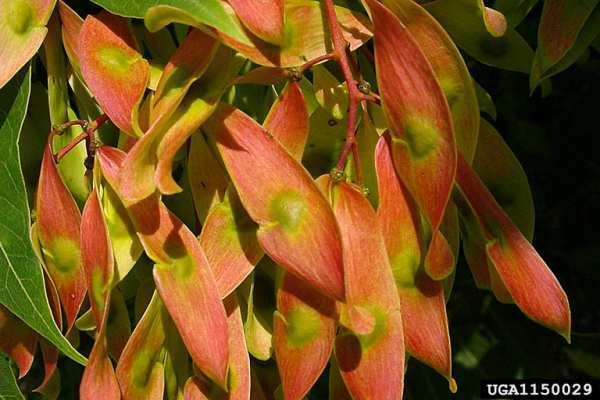 Preventative measures: A Risk assessment of Ailanthus altissima for Australia was prepared by Pacific Island Ecosystems at Risk (PIER) using the Australian risk assessment system (Pheloung, 1995). The result is a score of 12 and a recommendation of: reject the plant for import (Australia) or species likely to be a pest (Pacific). Informations on Ailanthus altissima has been recorded for the following locations. Click on the name for additional informations. Hoshovsky, M. 1986. TNC Element Stewardship Abstract: Ailanthus altissima and Ailanthus glandulosa. San Francisco: The Nature Conservancy. Summary: Report on description, habitat, distribution, threats and control. Hu, S. 1979. Ailanthus. Arnoldia. 39(2):29-50. Swearingen, J. M. and P. Pannill. 1999. 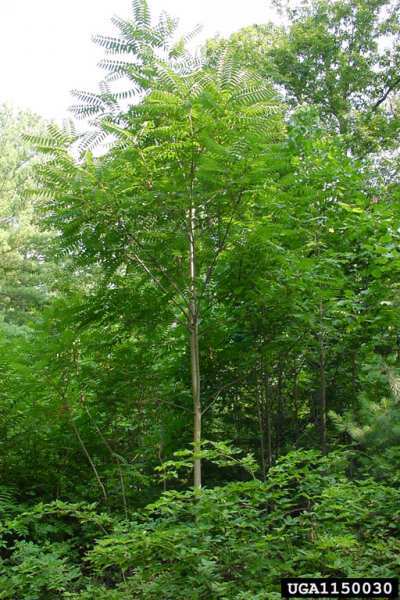 Tree-of-Heaven (Ailanthus altissima). Washington, DC: National Park Service, Plant Conservation Alliance, Alien Plant Working Group. Summary: Report on description, ecological threat, current management approaches, distribution and habitat in the United States, background.